Enjoy an Oktoberfest experience at home with your own German beer mug and make beer drinking unforgettable. The only thing more enjoyable than a cold, crisp, frosty beer is gulping it from your very own German beer tankard! Our plastic styrene beer mugs hold a full 44 oz. (1 liter) of your favorite alcoholic beverage and capture the traditional Oktoberfest style enjoyed by millions of people each year! Featuring a dimpled exterior, as well as a long, sturdy handle to make it easier to grip, these extra-large beer mugs are perfect for parties, enjoying sporting events, or throwing your own Oktoberfest event at home. Click 'Add to Cart' now to get one of these 44-oz. beer mugs today and celebrate friends with a cold, crisp beer! TRADITIONALLY STYLED PLASTIC STEIN- Never worry about breaking glass again. 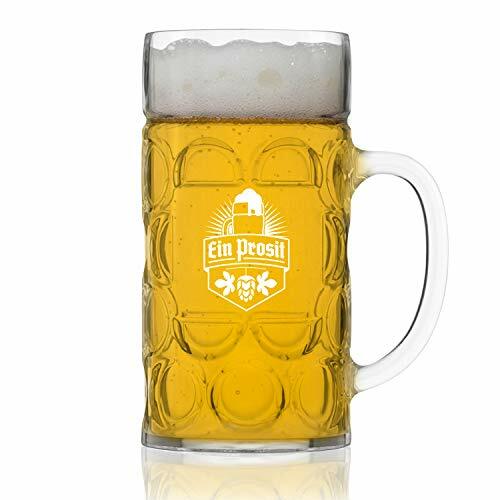 This lightweight beer mug has all the features of an authentic German tankard with classic thick walls and dimples. Plastic material makes it easy to grab on to, even if the lager is flying in a crowded room! CELEBRATE WITH CHEERS - Our 1-liter styrene tankards feature a high-quality graphic that says "Ein Prosit" which means "Cheers!" in German. Perfect for every party and great for celebrating with friends. Hand wash only! MADE IN USA WITH FDA APPROVED MATERIALS - Support the local economy by drinking beer that is free from harmful chemicals. Rest assured our plastic steins conform with FDA and CPSIA regulations and only use BPA-free and phthalate free materials. HANDSOME GIFT CHOICE - A smart choice for beer lovers or anyone looking to add to their home bar collection. These lightweight 1 Liter plastic drink mugs bring the Bavarian biergartens of Munich, Germany right into your home.